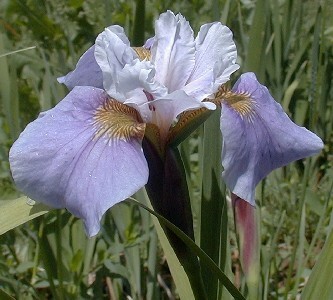 Iris × robusta is a naturally occurring hybrid once thought to be a species. 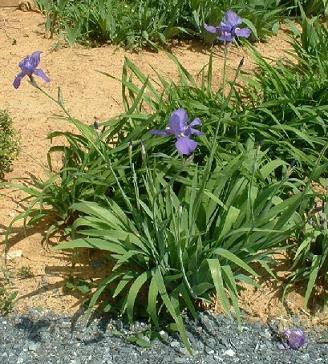 It is renowned for its purple foliage and black flower stalks. These traits are not strongly expressed in the original parent species, but can be quite dramatic in I. × robusta. The name applies to both manmade and naturally occuring hybrids between I. versicolor and I. virgnica. 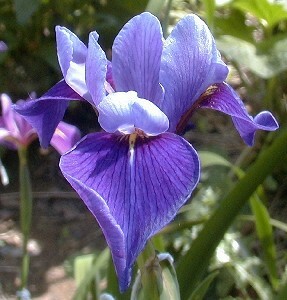 Iris × fulvala is another naturally occurring hybrid once thought to be a species. 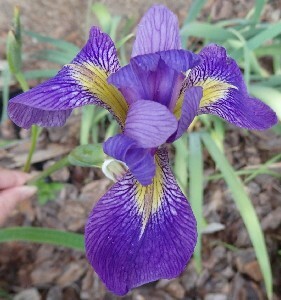 It is a member of the Louisiana Iris group, therefore it isn't typically referred to as Spec-X, but it deserves mentioning here nonetheless. The name applies to both manmade and naturally occuring hybrids, but it is rarely used except in a historical context. These are typically shades of purple and violet, since the I. brevicaulis ancestors are typically blue and the I. fulva ancestors are typically red. 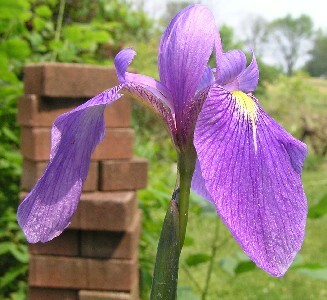 Iris × norrisii are often sold as Candy Lilies, but they are not true lilies. 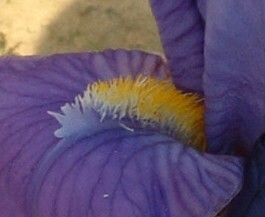 They are irises. 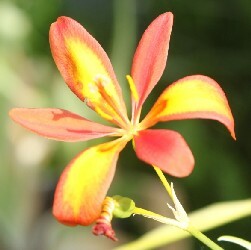 And they come in a wide range of colors and can have dozens of flowers per stalk. Well grown specimens can put on a stunning display. The first photo is by Sean Zera. The next four by Jim Murrain. The fifth one (showing nearly the whole plant) is by Mark Cook. I. × norrisii come from crossing I. domestica and I. dichotoma. The original 'Paltec' was a cross between I. pallida and I. tectorum by Ferdinand Denis in 1920 and formally registered about 8 years later. 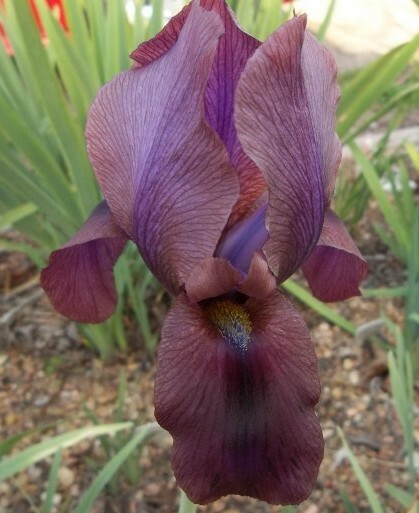 This was a hybridizing breakthrough for being the first cross between a bearded iris and a crested iris. Modern 'Paltecs' are being hybridized by Tom Silvers. Here are a couple of his registrations that will be introduced soon, we hope. All photos were provided by Tom. 'Dragonscrest' (Thomas Silvers, R. 2009). SPEC-X, 30" (76 cm), Mid bloom season. 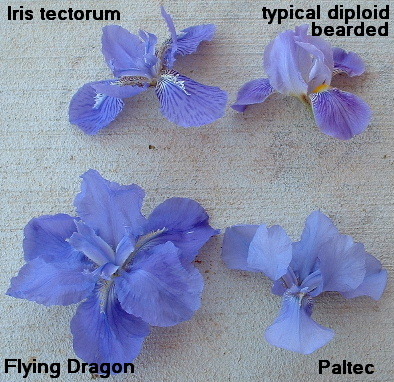 Standards and F, medium purple; style arms same blending to pinkish purple along sides; beards orange in throat changing to purple and white crest at end; pronounced sweet fragrance. 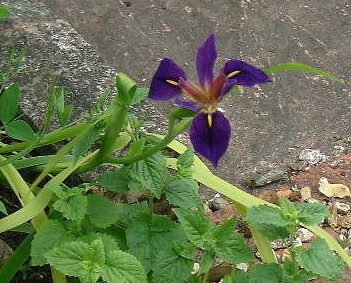 (Iris cengialtii x ‘Kupari’) X Iris tectorum. 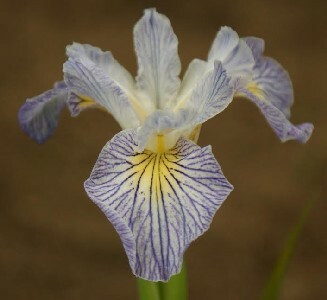 'Flying Dragon' (Thomas Silvers, R. 2004) Hybridizers Comments: Unknown parentage, but obviously from the bearded X Iris tectorum crosses I'd been playing around with. Relatively slow to increase and attractive to borers, I registered this one because of the general scarcity of this kind of hybrid and because it has bigger, more overlapping-form flowers than the 1928 hybrid 'Paltec'. 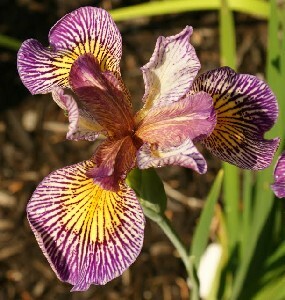 It also has another rare trait for these hybrids; it produces a small amount of pollen. No offspring so far. 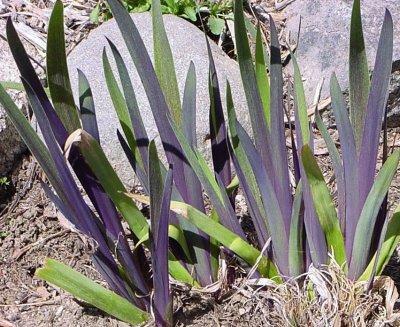 Cal-Sibs (sometimes written as Cal-Sibes) are a well established group of Spec-X irises. 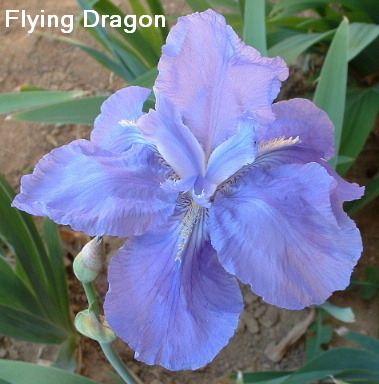 They come from crossing Californicae group irises with Chrysographes group irises. Although each group has the same number of chromosomes, diploids are often sterile. 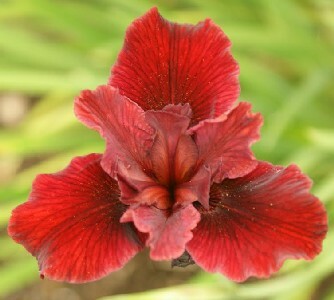 The photos below are provided by Cascadia Iris Gardens and depict Carla Lankow's amazing red-colored 'Rubicon', Jean Witt's 'Fauxmo' (ingeniously named for it's superficial appearance to I. missouriensis), and cultivars Lyric Laughter and Stitch Witchery. Lyric Laughter photo by Carla Lankow. Other photos by Margaret Spence. 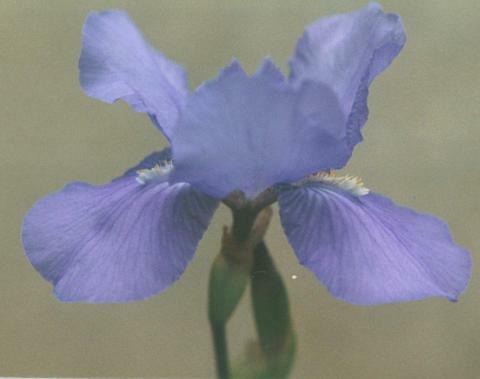 The purple Cal-Sib is 'Pacific Smoothie' and the photo was provided by Ken Walker. Sibtosa is a cross between a Siberian and I. setosa. 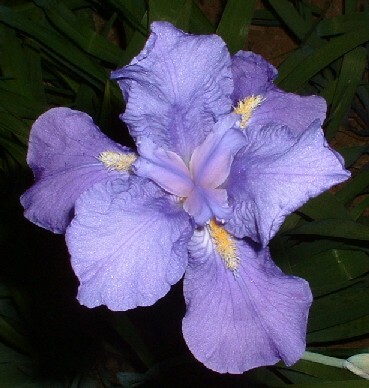 Shown here is a cultivar from 1994 called 'Mauve Snowtop'. Versilaev is a cross between I. versicolor and I. laevigata. They are sometimes available in the SIGNA Seed Exchange. 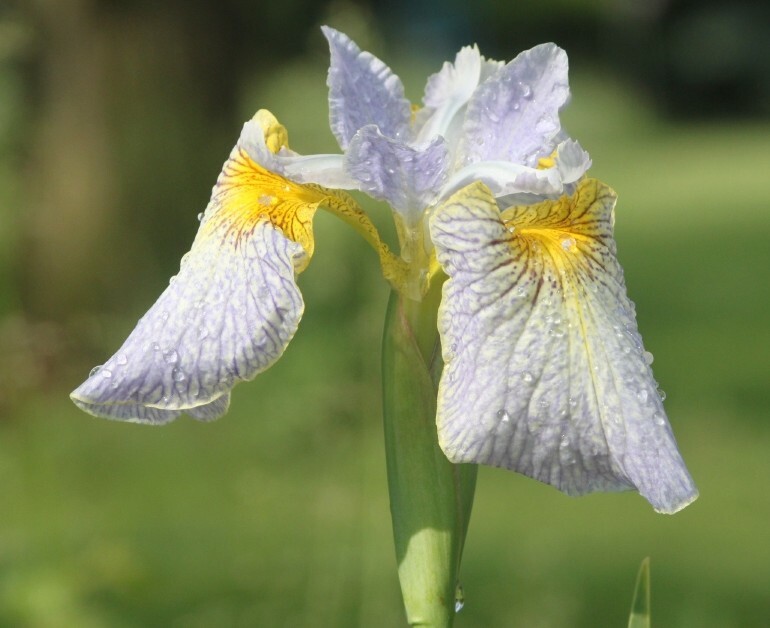 Numerous cultivars have been registered and introduced, both diploid and tetraploid. 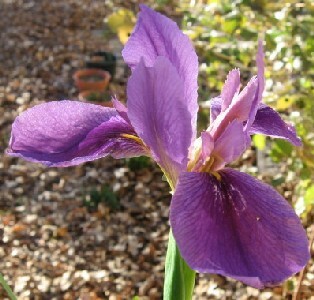 The first photo is from Dennis Kramb and shows a seedling grown from SIGNA Seed Exchange. The second photo is from Ken Walker and shows 'Asian Alliance'. Versata is a cross between I. versicolor and I. ensata. They are sometimes available in the SIGNA Seed Exchange. 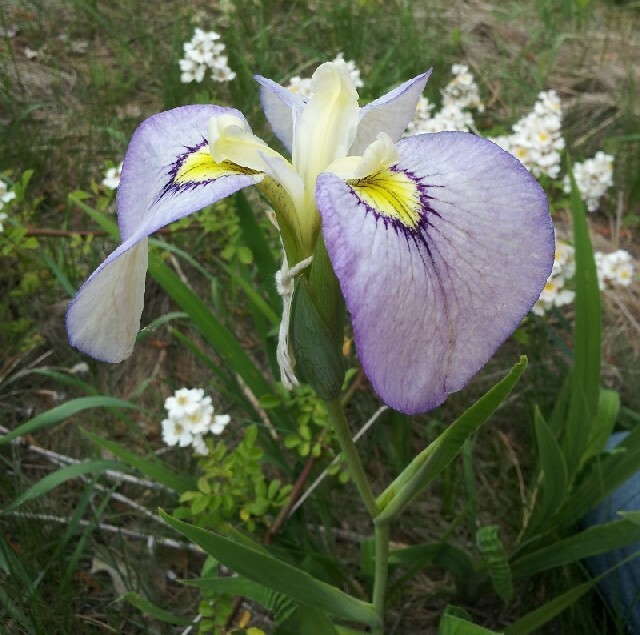 Shown here are some tetraploid versata grown by D. Kramb from SIGNA seed. 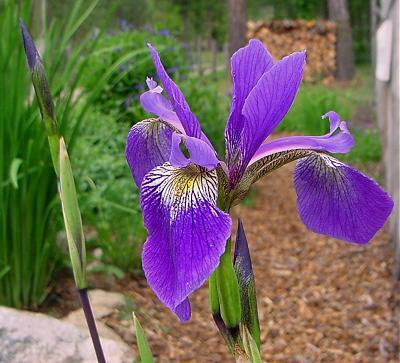 Pseudatas have the wonderful common name of Eyeshadow Irises. They are crosses between I. pseudacorus and I. ensata. They are almost always sterile, due to the unbalanced chromosomes. 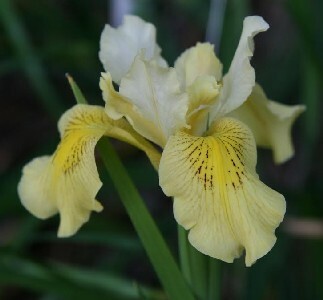 'Ally Oops' is a unique unusual cross between a Siberian and I. psuedacorus. 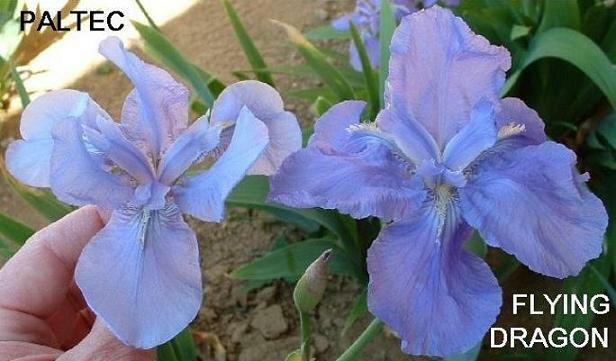 Regeliocyclus & Oncogelia are terms for hybrids between the two major Aril iris clans: Oncocyclus and Regelia. They are regarded as Arils rather than Spec-X, but they are usually found as primary hybrids between two species, thus making Spec-X an appropriate title. The following photos were provided by John Baumfalk and show the classic hybrids 'Andromache', 'Ballalaika Music', 'Tadzhiki Eclipse', 'Thor', 'Dardanus', 'Gamaliel's Wisdom', 'Teucros', and 'Orion'.